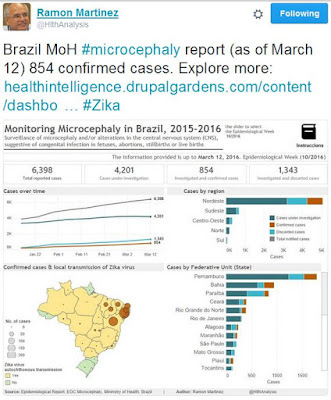 A couple of days ago Sharon Sanders of FluTrackers sent me a link to a blog called Health Intelligence run by Ramon Martinez, which has some of the nicest graphic representations of Zika and Microcephaly data I've seen. The charts I've looked at are interactive; you can easily select which Epidemiological Week you want to view. He has several Zika related charts, but if your interests run beyond Zika and Microcephaly, you'll find a ton of other health related graphics going back several years (I've only scratched the surface). I'll be putting a link on my side bar, and look forward to finding some time to explore.